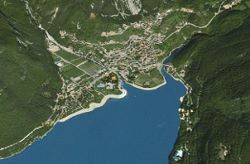 Welcome to Trentino at the Residence San Carlo on the Molveno Lake! We look forward to welcoming you in our residence that features a beautiful, quiet location away from the traffic of the main street, and only 150 meters from the picturesque town of Molveno. Even closer, just 100 meters away, expand the "green banks" around the Molveno Lake, always very well maintained, where on a soft lawn, equipped with sports and games for children, you can enjoy a moment of relaxation with your family or enjoy good company and you can also can dedicate yourself to water sports such as canoeing and windsurfing in the clear, fresh water of the beautiful lake. The rocky peaks of the Brenta Dolomites offer a stunning backdrop for adrenaline paragliding. But also lovers of climbing, trekking and mountain biking, are rewarded by a range of services throughout the region with an endless series of excursions and tracks that are easily accessible. Legambiente and the Italian Touring Club have awarded Molveno with the "Bandiera Arancione" (Engl. : Orange Flag) as a quality brand and our lake has been awarded five sails, for the naturalness of the waters and sound environmental management of the region and its institutions, by the renowned " Guida Blu " by the above-mentioned organizations . Come visit us, we welcome you!